This is one of those rare books that youngsters will curl up with again and again. 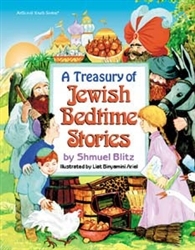 Bedtime will begin with a mother reading a story and pointing to the gorgeous full-color illustrations, and end with a little head on the pillow, and this book clutched protectively under it. These twenty-one stories cover the gamut from gentle humor to profound faith to warm kindness. The heroes range from kings and sages to wise travelers and fantasizing laborers. Shmuel Blitz tells a story with the zest and flavor of an imaginative zaidy or bubby, and when Liat Binyamini Ariel illustrates a scene, the reader is ready to jump into the action. Every story will hold a childâ€™s interest and keep him or her asking to hear it many more times. Add to that a sturdy, child-resistant binding and you have a sure-fire recipe for many days and nights of story-telling pleasure. Everyone will have his or her favorite stories -- but this book will be everyoneâ€™s favorite. Thatâ€™s for sure.